NEW ORLEANS, Louisiana, July 18, 2010 (AFP) - The US government raised concern Sunday over seepage near the Gulf of Mexico oil well but stopped short of asking BP to remove the cap which has halted the gushing crude for the first time since April. BP had earlier acknowledged some bubbles appeared near the wellhead but expressed optimism that the cap could stay on, saying tests were "encouraging" after three days and that a final solution was in sight. But tensions emerged as the government's pointman on the worst environmental disaster in US history ordered the energy giant to report swiftly on a "detected seep" and "anomalies" near the well head as experts monitored the seabed for cracks. 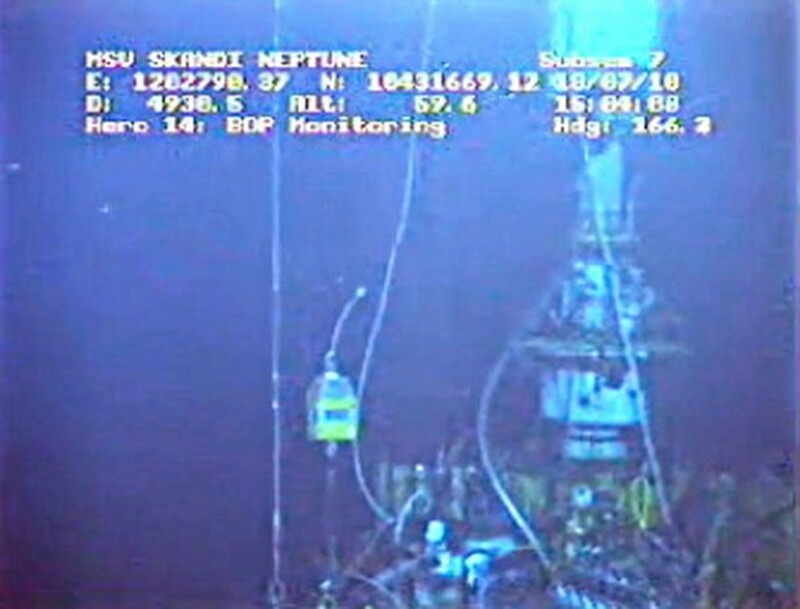 "Given the current observations from the test, including the detected seep a distance from the well and undetermined anomalies at the well head, monitoring of the seabed is of paramount importance during the test period," Coast Guard Admiral Thad Allen said in a letter to BP chief managing director Bob Dudley. Allen ordered BP to report to the government in no more than four hours when seeps are detected, and said BP must lay out its next steps in writing for "opening the choke valve as quickly as possible without damaging the well should hydrocarbon seepage near the well head be confirmed." Hydrocarbons occur naturally in crude oil, and their detection could mean that oil is seeping out from the area around the well, which began gushing oil after BP's Deepwater Horizon oil rig exploded on April 20 and capsized two days later, killing 11 workers. Speaking to reporters earlier in the day, BP's chief operating officer Doug Suttles said pressure was rising slowly in the well, as expected, and touted "encouraging signs" that would allow the newly placed cap to remain on the well until a permanent "kill" operation takes place in August. "In two different locations we've seen a few bubbles. This is not uncommon but clearly it's important that we check everything very closely so we're monitoring that," Suttles said. The US government was granting extensions to exhaustive well tests on a 24-hour basis, while BP said the valves on the containment cap that is staunching the flow would remain shut as long as no leaks are discovered. "Clearly we don't want to reinitiate flow into the Gulf if we don't have to," said Suttles. Three days of respite from the unsettling images of oil gushing into the Gulf of Mexico raised hopes among residents that this could mark the beginning of the end of what estimates suggest is the biggest oil spill ever. The start of the two-week operation to plug the well permanently by pumping in heavy drilling fluids and then cement is now less than two weeks away as engineers have only 100 feet (30 meters) left vertically to drill. Gulf residents, who have seen the relentless flow of crude tarnish their shorelines and cripple the local economy, reacted cautiously to news that the cap was holding back the crude, wary of being given false hope after weeks of botched BP operations. "I don’t know if it’s going help. It’s still a short-term fix," New Orleans resident and medical researcher Ashok Pullikuth told AFP. "The permanent fix is the relief wells. This cap has saved a month’s worth of spill damage." Transducers on BP's latest containment cap have given steadily increasing high-pressure readings since tests began Thursday on the well bore, which stretches down 2.5 miles (four kilometers) below the seabed. Seismic and sonar surveys and video footage filmed by robotic submarines in the murky depths of the Gulf have been monitoring whether any oil or gas was leaking through the rock formations on the sea floor. Allen did not specify what sort of "seepage" or "anomalies" the testing had found but warned earlier that "ultimately, we must insure no irreversible damage is done which could cause uncontrolled leakage from numerous points on the sea floor." Oil has washed up on the coasts of all five Gulf states -- Texas, Louisiana, Mississippi, Alabama and Florida -- since the Deepwater Horizon rig sank on April 22, two days after an explosion that killed 11 workers. Poisonous crude has killed birds, closed fishing grounds, decimated the tourism industry and done untold environmental damage, including to marshland nature reserves that might never fully recover. Thailand and Myanmar have signed a cooperation deal to promote tourism routes connecting ancient cities of the two countries in preparation for a travel boom expected from the Association of Southeast Asian Nations (ASEAN).